Matt took no time to find the truck I was looking for!! Matt and Kristen were very helpful. 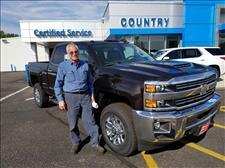 This is my second time purchasing a truck at this dealership. Referred a friend to this dealership. 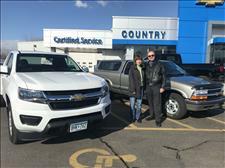 This is my second car buying experience at Country Chevrolet. The first time was almost 6 years ago. I have been on the website many times over the last 6 years just to see what's available, as I am a bit of a car guy. 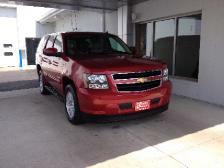 There is a wide selection of vehicles to choose from and the inventory is always changing. 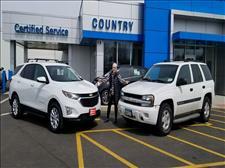 My salesperson Debra is a true professional at her job, she is very thorough and pleasant to deal with. 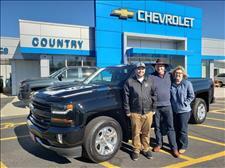 I also spent time with Matthew who assisted in the sale and was very helpful explaining all the technical stuff that comes with a new vehicle. 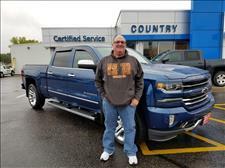 I have noticed that there are a lot of one owner trades, which means the customers want to do business at this dealership again. I understand why, they truly do care about your car buying experience. My wife and I were recently put in a position where we had to buy a car. After doing some searching, we found one at Country Chev. As soon as we walked in, we were greeted by Matt Renczykowski. When told of our situation, his immediate response was "Well, let me get the car, scrape off the frost, and we can take it out for a test drive". Matt's route was a good mix of in-town (stop and go), rural roads (hills and curves) and a highway dash back to the dealership, giving us a good feel for the car. We told Matt, yes, we'll take it. With no pressure to look at something else, Matt and others proceeded to handle the necessary paperwork. All the people we dealt with were not only courteous and professional, but genuinely took an interest to see that we were well taken care of. We not only left with the car we wanted, but a full tank of gas as well! 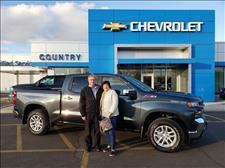 It's always been my feeling that the best deals and people to deal with come from a well established dealership in a small town, and Country Chev proved me right. My thanks to all who turned what was our unfortunate situation into a pleasant experience. I appreciate the great service and will recommend anyone looking to check you guys out first. 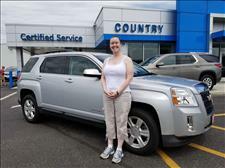 This is the 2nd Traverse that I bought from Country Chevrolet in the past 4 years. I was totally satisfied with Matt & the service I received. My son bought a pickup a week later through Matt too. The employees are all very friendly and want to help. 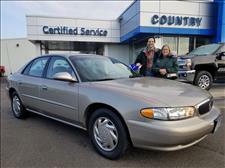 I was able to get just the vehicle that I wanted and Matt was very patient to help me find out what I needed to know with the new vehicle. Matthew Wuollet was awesome, he made the whole experience so easy. I really loved how he sat in the vehicle and went over everything, that was a huge help. And Kristen (the finance gal) was amazing as well. So simple, had everything ready. One of the best car buying experiences I ever had! Matt R was one of the best salespersons I have dealt with in buying anything ever in my life. Matt Renczykowski was the best! 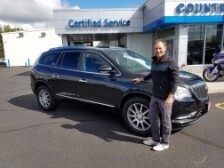 He went out of his way to find us the best car for our family. The Salesman that helped us was very helpful and showed us how everything worked. Very pleased with this Dealership. 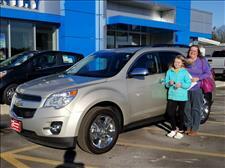 Matthew Wuollet, You made it very easy for me to purchase my new Equinox. You treated me with respect and you listened to my words. A lot of people don’t do that anymore. 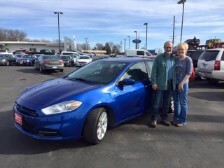 You listened to my comments when we were checking out the 2014 models and heard me say I preferred a different color, and you heard me say I wanted to stay on budget. And then you acted on that which you had heard. 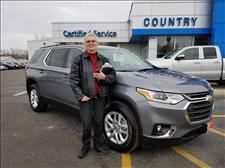 You, on your own without prompting from me, found a 2013 model in the color I wanted and within my budget. You respected my questions and answered them. Had you not made that effort, I would have walked away. That is great salesmanship. 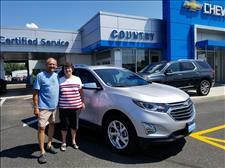 You are a tremendous asset to that dealership. My sense of life in general is that car salespeople are frowned upon and held up to suspicion. However, from the moment you came over to me on the lot, introduced yourself and shook my hand, I was comfortable with you and trusted your words. So, thank you Matthew for making this purchase easy for me. 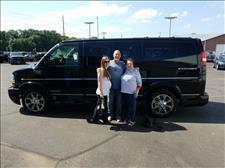 Giving up my van was a challenge due to all of its history related to my husband and daughter who died. So, thank you again for helping me to make it easier. I truly appreciate it. 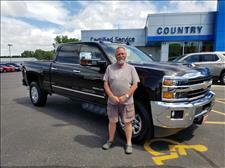 I was referred to Country Chevrolet by my brother-in-law who had purchased his vehicle there. 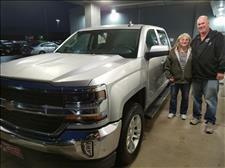 Even though they were an hour drive away he stressed their apparent fairness and value compared to local dealers. I feel he was correct in that opinion after buying my car from them. Great buying experience. No pressure and creative with working out a competitive deal. 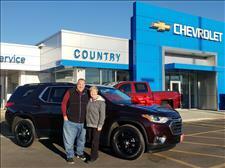 I like buying local and enjoy dealing with all the people at Country Chevrolet. 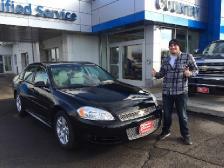 Matt, thank you for making our purchase seamless and an enjoyable experience! 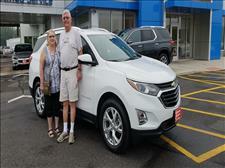 We are enjoying the car so far and are sure it will serve us well in the future. You are the best! 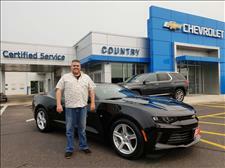 I found a car I wanted to test drive online, as well as a handful of other cars at other dealerships. I haven't bought a car in 13 years so I wasn't sure how things were these days. It was fabulous. We called ahead to make sure it was still there. It was waiting for us upon arrival and ready to test drive. 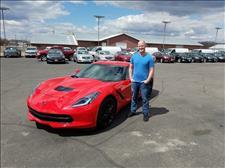 Matt R. our Sales Rep knew everything about the car and was able to show us a ton of cool features. The car was exactly as described in their online profile. I bought it on the spot. 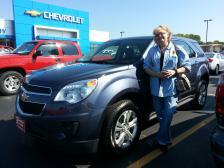 The purchasing process was really quick and easy and I couldn't be happier with my new SUV. 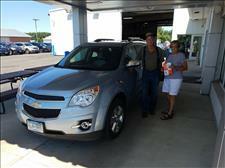 Everyone at Country Chevrolet was very nice and extremely helpful. I'm glad I bought my car through them, and I would recommend Country to anyone. Mitch did a great job at getting me set up and ready to ride the roads. Thank you guys! Excellent Experience from everyone I worked with!! 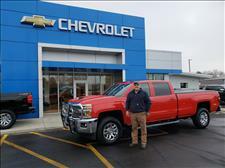 They worked with me on my loan, Matt the salesman was very knowledgeable and helpful throughout the process of my purchase of a 2013 Chevy Volt. 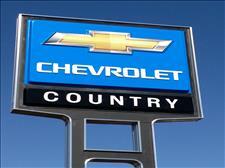 We have bought many vehicles from Country Chev over the years! We are always treated like family! Love the small town feel of this dealership! Kristen and Matthew always take good care of us! 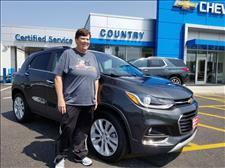 Matthew W., my salesman, was very knowledgeable and did a great job! Matt & Tom - Thanks for everything. You guys are the greatest. 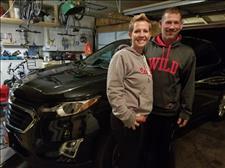 I want to give a big "Thank You" to Dave Stifter and your service crew that was able to repair my wife's Trail Blazer a couple of weeks ago. It was very important to my daughter as she was taking her driving test the following morning and preferred to drive the Trail Blazer instead of my truck. (She passed her driving test as well.) 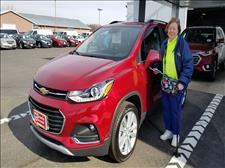 Not only did you get the vehicle repaired in a timely manner, but also let us use a loaner car during the day our vehicle was getting repaired so my wife could get around town. 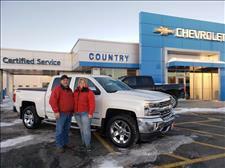 It is very nice to have a friendly local dealer such as Country Chev. in Annandale. Thanks for the great service!! 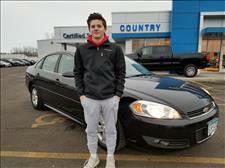 If you are looking for a new or used car, see Matt Renczykowski. 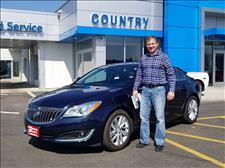 Matt is professional, genuine, personal, friendly, and will make sure you get the right car for you. He goes the extra mile to satisfy his customers. My experience buying my car from him was great. Thanks, Matt. Dr. Mary Fischer D.C.H.,CHt. 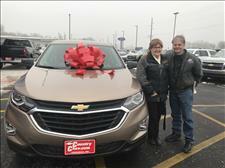 Country Chevrolet is the place to go! Thanks Matt Renczykowski! 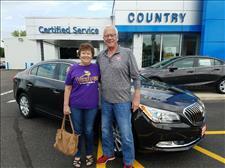 Matt we have already recommended you to our family and friends when they consider their next purchase. 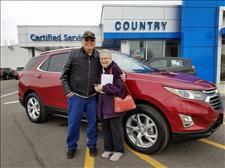 I liked the way you followed up on all my email inquiries when we were in the looking process and trying to decide on what make and model the next vehicle would be. When my 07 Taurus needs to go bye bye we will be looking in your direction.